Arriving at 'The Wing' at Silverstone on a cold and windy afternoon in early Spring is like turning your colour saturation down to zero. The old World War II bomber base airfield is forbidding at the best of times, but today there's one heck of a monochrome welcome. Mercedes has rolled out a bevy of its most iconic silver arrows race cars to welcome us into the warmth inside the dining room. It's an arrowhead of competition cars that together have notched up over a century of race wins. We're here at Silverstone because Mercedes is celebrating 125 years of motorsport. To that end, the Germans had invited the great, the good and its rapid forces division of historic competition cars to the home of F1 and Wheels had sidled in for the ride. Rather than tease you with what Mercedes had served up, I’m going to cut straight to the chase. Look at the list of drivers below. It’s ridiculous. A long line of historic cars were available to casually hop into and have a chat with a top-line racing driver while they attempted to scare the hell out of you on either the National circuit or the Stowe loop. At first I was a little crestfallen that I wouldn’t be allowed to drive any of these priceless treasures, but having seen what’s involved to even start some of them, it’s no bad thing. Except perhaps for the 10 modern F1 cars. It’s these cars that grab your attention when you walk into The Wing, the massive function centre above the pit lane. There’s an unbroken rank of Silver Arrows and it’s fascinating to see the development of the cars each year, from the matte-painted ex-Brawn car that is the 2010 MGP W01 (these snappy names that sound like inkjet printers are an F1 thing, unfortunately) to the current 2019 model. Nestled in among them is the 2012 car in which Michael Schumacher raced his last F1 season. It’s fascinating to walk along the row, watching the front wings grow more convoluted, the side pods more complex, the front suspension more intricate and the flat floors ever wider. Compare Mika Häkkinen’s V10 car from 1998 with the 2018 car of Lewis Hamilton. It’s night and day. On the other side of the room is an astonishing walk through time from the 1909 Blitzen Benz. This monster featured a 21.5-litre inline-four and only two of these behemoths now exist. When the car was fired up, the pulses of air being thrashed out of each five-litre cylinder set your diaphragm beating in time. I can only think it must have been the refinement benchmark for the diesel in a TE Gemini. Next up is the W 125 Streamliner, which set a flying kilometre record on an autobahn in 1938 of 432.7km/h, a mark which went unbroken for almost 80 years until Koenigsegg squeaked past it in 2017 with an Agera RS with almost double the horsepower. Quite amazingly, this pre-war racer had a drag coefficient of .17, a good deal better than any modern production car. The current mark stands at a Cd of 0.22 for Mercedes’ A-Class sedan. We could take all day talking about the rest of the cars in the room. The Sauber C9 that won Le Mans in 1989, the Bathurst-winning SLS and the Nurburgring 24hr-winning AMG GT, not to mention the CLK GTR, AMG’s first racer, the famous 6.8 SEL ‘Red Pig’, Bernd Schneider’s DTM-winning CLK and the 300SL from 1952. How about the remarkable Penske-Mercedes PC 23 IndyCar that featured the radical Mercedes 500I engine? ‘The Beast’ won the 1994 Indianapolis 500 by taking advantage of a loophole in the rules that allowed greater capacity and more boost pressure for low-tech two-valve-per-cylinder pushrod engines. In effect it was to allow teams without vast budgets to compete with cheap ‘stock blocks’. Ilmor Engineering didn’t see it quite that way and developed a 1000hp engine for Mercedes that was 200hp more powerful than any other in the field. Al Unser Jr’s winning car had lapped every competitor other than F1 world champion Jacques Villeneuve by the time the chequered flag appeared. Before the car had even returned to its team HQ in Bloomfield, Michigan, the rules had been changed. 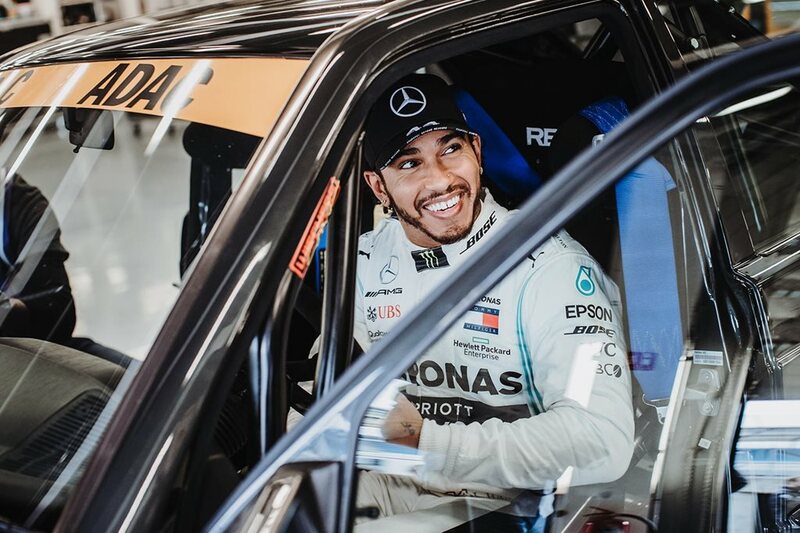 Lewis has been involved in an impromptu race with team boss Toto Wolff, an ex-racer and handy steerer himself, when the two of them had commandeered a pair of 190E 2.5-16 Evo IIs. I know for a fact that Toto had bagged the faster car, although I’m not sure who crossed the line first. Valtteri Bottas is due to wing in today, the announcer in the building giving us the cue to head out onto the balcony to watch him come past on track and to contract hypothermia. He does a couple of fast laps and then decides that he hates his rear tyres and needs to kill them. A demented doughnutting session then commences, but let’s just say that the Finn wouldn’t be taking home any prizes at Summernats. His circle work needs work. We then head out in some old stuff on the Stowe circuit. Roland Asch pedals us round in a 1904 Mercedes-Simplex. Then I jump in with Bernd Schneider in the 1928 SSK. With its screaming supercharger and 165kW 7.0-litre inline six, it’s a riot. Schneider, who has zero mechanical sympathy, drives the car as if he’s on a quali lap, oversteering it into hairpins and using engine braking instead of the woeful anchors. From there it goes into fantasy stuff, ex-V8 Supercars pilot Maro Engel driving a few laps in a 1955 300SL Gullwing. I inform Cam Kirby, our resident motorsports nerd. “ASK HIM ABOUT SHANE VAN GISBERGEN” comes the reply. I don’t ask Maro about SVG and, after YouTubing what Kirby was on about, am relieved that I didn’t. Engel’s a lovely bloke, but he’s very respectful of the Gullwing out on the Stowe circuit. I’d just seen Bottas drifting the thing, so I’m a bit crestfallen. Recompense comes in a lap with Ellen Lohr. You probably haven’t heard of Ellen Lohr. I’m projecting somewhat here, because I hadn’t heard of Ellen Lohr. She did a great job compering the gala dinner the night before, but other than that I’m in the dark. It turns out that she’s the only woman to have ever won a DTM round, beating the likes of ”Mr DTM” Schneider and ”King” Klaus Ludwig in the process. She looks like your mum. I’m projecting a bit here too, because she looks like my mum, but she’s acquainting herself behind the wheel of a 1980 500SL rally car and beckons me to jump in. This car never turned a wheel in anger back. It was destined for the 1981 season, with Walter Röhrl leading the team, but Mercedes discontinued its rally activities prior to the season commencing. Shame. She’s sideways before the thing has even left the gates of the car park and delivers the most fun lap of the day. There’s something quite hilarious about seeing a lady who looks like my mother come bang the car into second, give it a giant bung and then send 220kW to the balloon-like Fulda Rotecos. From there, it’s time to suit up and head out with some of the faster cars. At this point, it would be germane to point out that I’m a tall chap with a long back, so most race suits tend not to fit all that well. Or, as in this instance, at all. Imagine trying to don a one-piece garment that’s, crucially, about 10cm too short in the distance between your shoulders and your scrotum and you get some idea of the discomfort involved. Still, some sort of herniated testicle seemed worth a ride in the AMG GT4 car out on the circuit. I put one foot into the passenger seat and then tried to lever my 192cm frame through the aperture in the roll cage. The enormous Stilo helmet clonked in, at which point the HANS device hooked onto the top bar and that was it. I was lodged firm. Only after a lot of hapless squeaking and wriggling did I extricate myself. You’ll have to read Alex Inwood’s article in Wheels magazine next month if you want to know what it’s like inside one of these. I had better luck in the AMG GT3 car with Engel, which was more fun and a good deal faster. It peaked at 237km/h on the back straight before Maro jumped on the brakes. That was significantly better than the 200km/h Esteban Gutiérrez managed in the fantastic 190E 2.5-16 Evo II that Lewis Hamilton had been driving the previous day, but both paled next to the 248km/h that Gary Paffett managed in the 2018 C63 DTM car. With a 4.0-litre V8 good for 360kW, the C63 was the loudest thing lapping the track and, after seeing Paffett go a bit Burke and Wills on his initial out lap, I wanted to give the car the once over to see whether any pieces crucial to staying dirty side down had taken their leave. All looked fairly intact, so I was strapped in, forgot for a moment about my deformed plums and gave the 2005 DTM champ the thumbs up. The vibration throughout the cabin when the V8 came on the cam was incredible, blurring your vision slightly and making it feel as if you were being tickled by a hundred hands. Paffett manhandled the car over every kerb he could find, leaping it back onto the line and hitting 248km/h on the back straight. The car was incredible, yet Mercedes doesn’t see a future, for the time being at least, in DTM. This car is the last of the line. I haven’t driven a thing today yet it’s been an incredible event. No other car manufacturer could put on anything quite like this, furnishing it with such a rich history and such a galaxy of motorsport stars. Porsche would probably come close, but its racing history started relatively recently, in 1951. We’ve been screeching around a track in a car 48 years older today. It’s an amazing show of power projection and it has me mentally calculating how old I’d be when the marque celebrates its 150th anniversary in motorsport. Too old, I reasoned, so it’s best to just try to soak in the event. I’m sitting in the pits, when an old chap shuffles up and sits with me on the flight cases. We share a moment, looking over the W196 R Formula One car from 1955. “Ist schön, ja?” I try in my rough German. He smiles and breaks into an uninterrupted five-minute burble. It dawns on me that I’m talking to Hans Herrmann, the 91-year old who drove at the same time as Fangio and Moss, later winning the 1970 Le Mans in a Porsche 917. He’s telling me about his drive in this car in the 1955 Argentinian Grand Prix. I can’t take it all in. It’s been that sort of day.